Life is a journey from the head to the heart. Ramana Maharishi, one of the greatest sages of Advaita Vedanta, said, "God will grant himself here and now to whomsoever offers himself to God. Only he who has lost himself and whose consciousness has taken form of That [Brahman] will revel in the experience of the pure, unchanging and eternal Sivam." This emphasizes the little-known truth that supreme devotion [parabhakti] and jnana arise at the same time. Srimad Bhagavatam says that the easiest way to attain liberation in Kali Yuga is through Bhakti. There are volumes of ancient texts written about Bhakti, one can learn those from a master, what I bring to you here is the 'Bhav' - experiencing the elixir of Bhakti. I was listening to the short story by Dave Stringer about Bhakti Sant Tukaram, who used to go into trance samadhi singing to his Lord Vitthala. Dave visited Tukaram's village temple, when he was in India, started singing and went into trance. When he regained consciousness it had become dark. A passing Sadhu had put a Teeka on his forehead and garlanded him. People around told him he'd been singing for hours! Of course for Dave it felt like few minutes. There is no difference in the Samadhi of Tukaram and the trance singing of Dave. They both experienced their consciousness. This is the revival! Living the knowledge, experiencing the Bhakti Bhav. Rishis were the noble leaurates of consciousness, they discovered the secrets of creation and consciousness. The great Rishis EXPERIENCED consciousness, they became consciousness. At the time of Sri Rama Krishna some said he was insane. Beautiful article on him on ST: http://www.speakingtree.in/public/spiritual-articles/my sticism/going-insane-in-search-of-truth. Recently I had a very interesting conversation with a Master about my past, present, and future. He gave me new insights on Karma, Dharma (purpose of life), and enlightenment (I wish everyone could hear it). When he indicated what gift I have to serve others, my purpose - my direct Dharma, it plucked a cord in my soul - it was a great Aha! moment in my life (I posted on a previous blog). This blog is also inline with that. "...Choose your favorite songs and put yourself in a state of relaxation. It may be with one of those umm iPods, with earphones. ...give yourself 20-30 mins. of that meditation. ...it is an energy Yoga.You see the four fold rhythm or the sacred songs are in the rhythm of natural meditative breath, this way the songs support it." He said that this form of meditation also makes one experience consciousness. I believe the 4 fold rythym he is referring to is perhaps the bhajans/sacred songs that are called Pad - like the poems of Bhakti saints were Pad which have 2 lines of 4 sections, 8 syllables each. Maybe I'm wrong and it refers to something else. The important thing to see here is that the ripples from the rythym and vibrations of these sacred songs arouses higher states of consciousness - the soul resonates with these vibrations. It unifies our consciousness, the songs brings harmony in noise outside and inside. These ancient sounds, like mantras, are synonymous with consciousness. It is good to listen to bhajans on Ragas too, because these Ragas are ancient and they are at the same frequency as consciousness. See like when you are in the company of an enlightened saint or highly evolved soul; their presence and unseen vibrations, energy, permeates you, and takes you to higher states of consciousness. Have you experienced this? It is the same when you dissolve into the vibrations of these sacred songs! Meditation happens spontaneously. 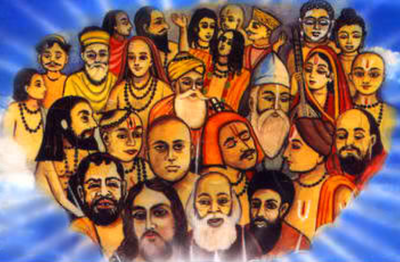 All Sadhanas of Bhakti are perfect, God celebrates the diversity of Bhakti. In Bhakti, Siddhi and Samadhi happen effortlessly. In Bhakti the mind drops easily, the seperation drops. In divine love there is no ego, "I" drops. There is total surrender. Surrendering our entire SELF to the Lord - Atma Samarpan - we become empty and then filled with HIS presence. What is amazing is that we are witnessing the revival of Bhakti. In countries outside India, such as the US, people who aren't even "Hindus" are enjoying Bhakti and Bhav through Kirtan. Without even knowing anything about Govinda, or Hanuman, or Devi, or Shiva they are simply merging into the rythm. It's experiential. They are experiencing their consciousness which is beyond all identities of religion, race, color, country... Identities are skin deep. They all feel the same universal love! They are already experiencing great heights of Bhakti through this transcendental music ! When the heart opens up, divine love manifests! The light of consciousness flows through and expands infinitely. In Kirtan, call and response singing, you share this experience with others, the group becomes an extention of you, and you feel that connectedness with everyone. Everyone singing in rythm, singing in harmony, like a symphony of souls, we become one! Then life becomes a dance of consciousness...life becomes a celebration! I don't know if they even know what's happening! What is amazing if you see, knowledge is evolving here, Bhakti is adapting and evolving here. What evolves and adapt survives, what stagnates, goes extinct. The wonderful thing about love and music is that it is universal. So is Bhakti, there are no boundaries! I say to you: Oh dear brothers and sisters! Experience Consciousness! A human being of any faith can merge into this bliss. Hasidic Jews, Sufi saints, Eastern Orthodox and Western Christianity, Vaishnava gurus, Saktas and Shaivites; all have explored and revelled in the ecstasies and agonies of divine madness. 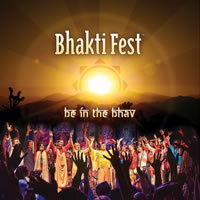 Bhakti has to be experienced. The soul, consciousness has to be experienced! The easiest way now is through Bhakti. The door to the home of consciousness is through the heart. 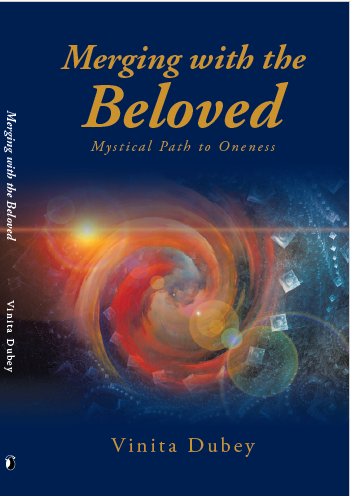 The message of this blog is: Put on your favorite Sacred Songs and meditate on them, experience consciousness!